Baby Hazel has her hands full as she helps her Mommy out with little brother Matt! Today she will put all of her big sister skills to the test. Help this cutie keep Matt entertained and out of trouble so that her Mom can finish all of her work. It won’t be easy, but being a big sister never is! Baby Hazel must keep Matt occupied with toys and treats as their Mommy works away. Hazel must stay on her toes to keep Matt out of trouble and happy as they are playing. Watch out for those dirty diapers! Lunch can be a messy time, especially when Hazel’s brother Matt is a picky eater! Help Hazel prepare a special treat and coax Matt into cleaning up his plate and giving her a smile or two. Keep the wet wipes on hand to clean up those messes! Poor Matt has an upset tummy! 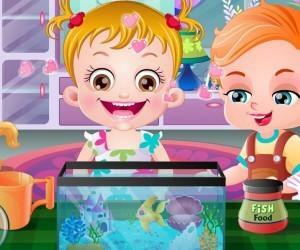 Help Hazel entertain the little fellow and clean up all those messes! Don’t forget to keep big sister happy in all of the hustle and bustle! Be sure to remember the medicine! The kids are feeling grumpy at bedtime. Help this little cutie get her baby brother ready for bed and keep him happy all at the same time! It is exhausting being a big sister so don’t forget to help Baby Hazel tuck in at the end of a long day! 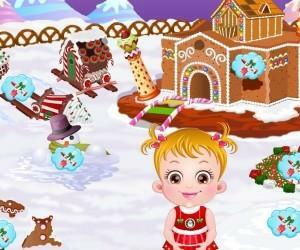 This cute game allows players to be a big sibling for the day! Easy to understand instructions, adorable characters, basic eye hand coordination skills, and catchy puzzles will have your whole family helping Hazel take care of baby brother Matt! Baby Hazel is very affectionate towards her little brother Matt because she loves him very much. As her mom is busy with cooking, Hazel has to look after Matt take care of all his needs. Why don’t you help our little princess take care of her brother? You will help Hazel feed him on time, give him his favorite toys and help him fall asleep when its time for bed. Use the mouse to point and click, to control Hazel and her world!